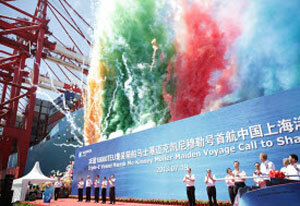 Maersk Line’s first Triple-E vessel “Maersk Mc-Kinney Moller” made its maiden call at Shanghai Yangshan port on 19 July. Dignitaries from local authorities, Shanghai International Port Group and Maersk Line gathered for a port call ceremony to celebrate the historic moment. The first Maersk vessel called at Shanghai was almost 90 years ago, signifying the beginning of Maersk Group’s business in China. In 1968, Maersk Line had only one non-containerised service connecting Asia and Europe that consisted of twelve sailings per year and carried approximately 8,000 tonnes of cargo. Today, Maersk Line vessels call at all major ports in China offering a wide range of dedicated weekly sailings to all parts of the world. 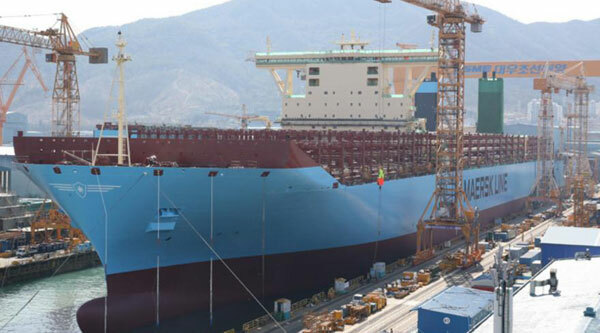 For Maersk Line’s Asia-Europe trade, two-thirds of the cargo goes to and from China. “The vessel is so huge and beautiful! More importantly, it features innovative technology, such as waste heat recovery system, leading to the energy efficiency and environmental performance. It emits 50% less CO2 per container moved compared with the current average on the Asia-Europe route. The Chinese government is seeking solutions to save energy and reduce carbon emissions, and I believe our practice can provide valuable experience in this regard.” shared Mr. Hu Ke, Head of Government Relations, Maersk China. The Mærsk Mc-Kinney Møller left Shanghai to continue its maiden voyage. There are still a number of port calls coming up, and customers, fans and visitors will be ready, waiting. Posted by maritimenews on July 29, 2013. Filed under All news, Business, Company News, Latest news, Shipping News, World. You can follow any responses to this entry through the RSS 2.0. Both comments and pings are currently closed.